A lot better organised than Mr Russell’s play but still a few hiccups along the way. It started early as Mr Masui had told me that the trip left at 7:00 a.m. so I asked Denis to give me a lift as I didn’t think it would be the best of starts to be ‘lathered’ as we got on the Dala Dala. On arrival I found out that we weren't actually leaving until 8:00 am and they then informed me I needed a copy of my visa. As I had given this to Denis, who needed it for a job he was doing for me, I had to call him again and ask him to return. I said there was no rush as we weren’t leaving until eight and hung up, only to be informed that when I was ready we were going. Not the best of starts but it certainly got better. For a start, teachers ride shotgun (front seat) and this is a whole different experience from the cattle class in the back that I am used to. I saw a whole new world that is usually not visible because my head is in the roof of the vehicle; which, coupled with the passengers crowding round me, gives a very restricted view of life. 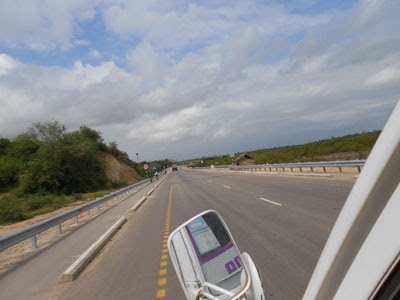 An enjoyable Dala Dala ride, who would have thought it; and when we turned in Tanga onto the main Mombassa highway, with smooth metaled surface, all my Christmases had come at once. 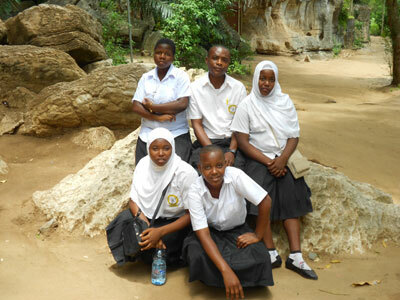 The trip, with Form III and Mr Pius was to the Amboni Caves, which is a very large complex of limestone caves about 8km north of Tanga. The caves are carved by the sea, unlike the limestone caves I am used to in the dales that are usually carved by rivers. At the ticket office the man asked for my proof of residency. As my visa does not bestow this at all I simply said, “I am not a resident” and he never even bothered with my papers. The price of entry was Tsh1000 for residents and Tsh20,000 for visitors. 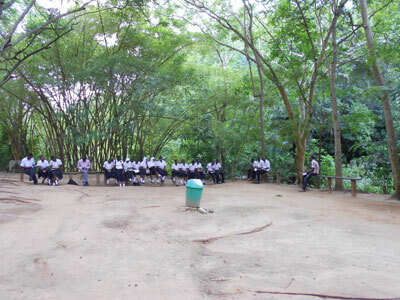 In the event, presumably because I was with a school party, he let me in for the child’s price of Tsh10,000. 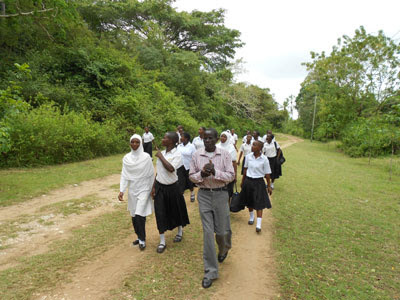 We were then met by our guide as there are many twists and turns inside that could lead to trouble, and he started his explanation in English until I stopped him and pointed out that he should speak in Swahili for the students. Then followed a lengthy talk, during which the words limestone, stalactite and stalagmite were about the only words I registered, followed by a question and answer session. I was amazed at how many questions there were and the obvious interest shown and, not for the first time, I was proud of my students. For the tour of the caves they took pity on the Muzungu and I went round with the English speaking guide whilst the students picked up another Swahili guide. 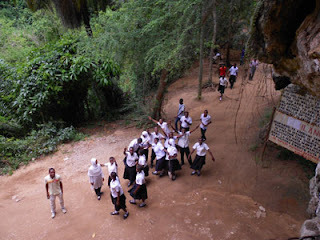 The tour mainly consisted of pointing out outcrops and stalactites that bore resemblance to animals etc. Some stretched the imagination but, to be fair, there were some that were excellent. After the tour the usual trip money was spent on pop and biscuits and we prepared for our journey home. The Dala Dala had left us and gone to earn some money with the promise to return to pick us up at 2:00. T.I.A. was my comment as the minibus finally appeared at 4:30 and we boarded for the bumpy ride home. The sun was setting as I walked the 400m from the road to the Y.M.C.A. and needless to say I was very tired but wouldn’t have missed ‘Our Day Out’ for the world.